You’re well aware of the benefits of integrating templates into your design workflow. But it’s not just design work that can be improved by the use of templates; so too can the project management side of your business. 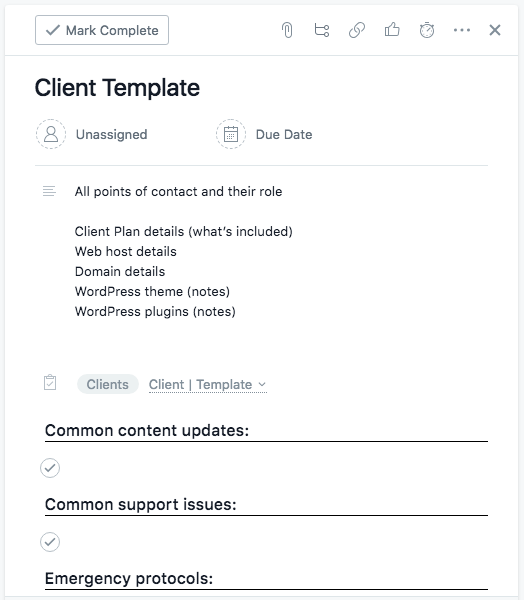 Today, I want to give you a close-up look at how to manage your client lists more effectively with Asana templates. Asana is one of the most indispensable tools to my WordPress business. While many people may use it to manage tasks and checklists (which I do as well), I find that its benefits as a project management platform extend far beyond that. Specifically, I find it to be quite powerful when you want to manage your client lists. 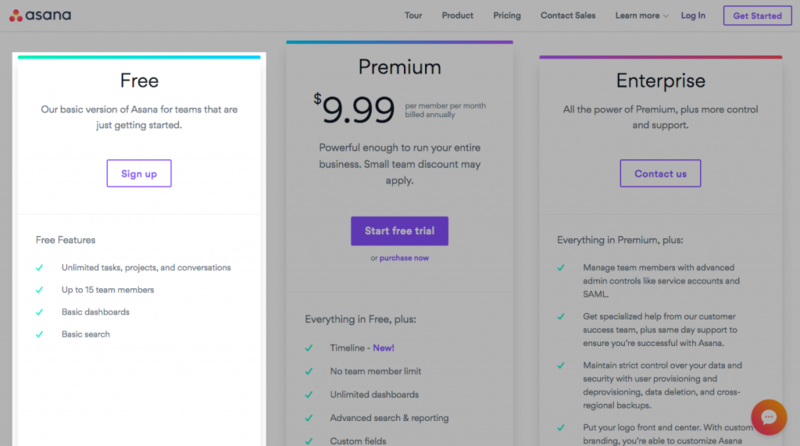 Although Asana comes with premium memberships, many of those features are only needed when you’re running a large agency and want to grant access to clients. For the purposes of managing your WordPress projects, the free package should suffice. 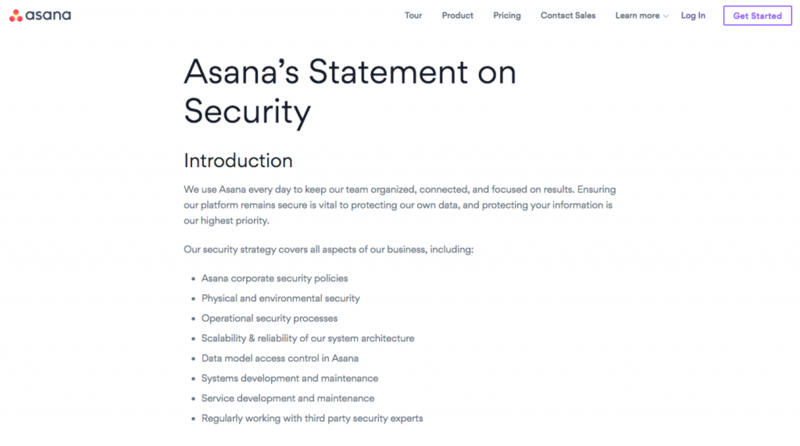 Asana takes security very seriously. From its strict data policy in-house to its choice to use Amazon Web Services to host its encrypted platform, your clients’ information is in good hands with Asana. As you develop more processes for your business and add more team members and contractors to the mix, you run the risk of information getting displaced. Even if your team is well-trained on where to store all critical project information, there’s also the chance that it won’t get properly recorded. 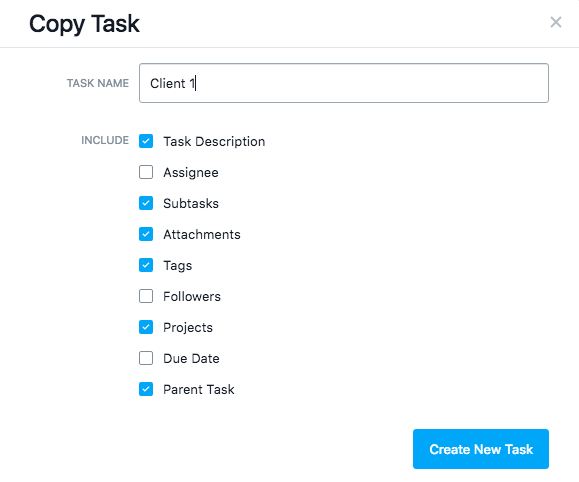 With Asana templates, you can prevent that sort of inefficiency and disorganization from slowing down your workflow. With Asana, you’re enabling your team to enter into every new client conversation equipped with all the information they need. The same goes for your contractors. Add them to the client folders or lists for projects they’re working on and provide them with all the information they need about client contacts, project specs, WordPress customizations, and more. They’ll never have to hesitate on a project call or stop to ask you for an answer to a question they’re unprepared for. All the answers are right in Asana, which means you and your team members can provide instantaneous and appropriate support to your clients. Finally, there’s the benefit of automation. Granted, client cards need to be filled out at the start of each project and updated throughout as new information becomes available. However, by using templates, you can more quickly add new clients to your list while ensuring that consistency is maintained from project to project, regardless of who handled the intake. In the video above, I showed you an example of what my client template and lists look like and how to replicate them. 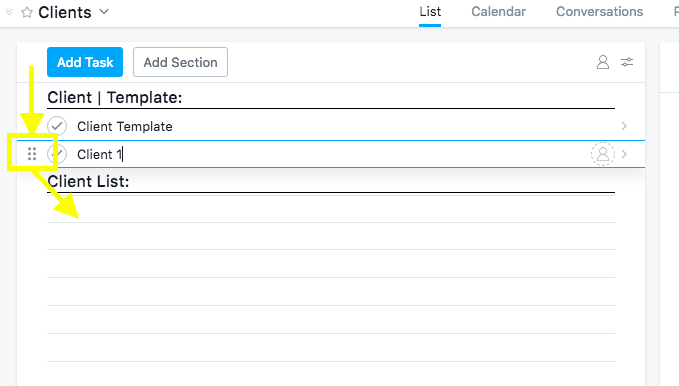 Below, I’m going to start from the very beginning to show you how quick and painless it is to manage your client lists with Asana templates. First, you’ll need to sign up with Asana. Then, enter your empty dashboard. If it doesn’t take you there immediately, click on “My Tasks” at the top of the page. On the left-hand sidebar, look under “Projects”. 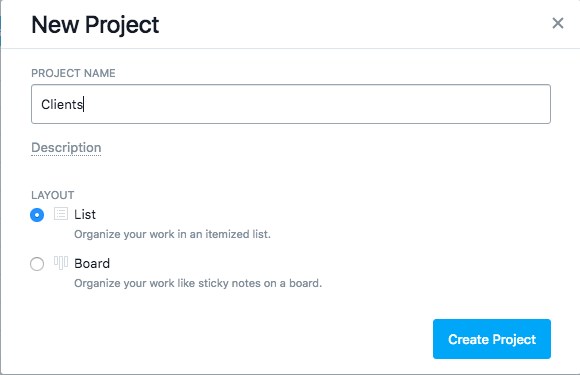 To add a new one, click the small plus-sign to the right of the word “PROJECTS”. Name your client folder whatever you like. 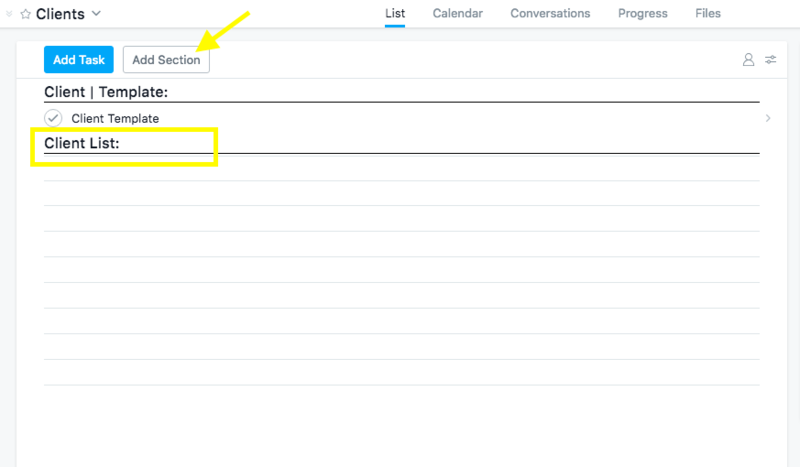 Asana will give you a choice between List or Board. For the purposes of managing your client lists and keeping them well-structured, choose Lists. While this step isn’t necessary, it will help keep your Clients folder better organized and prevent your template from getting lost in the shuffle. Click on “Add Section” at the top. Enter a name for your client template. To set this up as a section title, be sure to leave the colon (:) after the name. Then hit the “Enter” key to set the section name. Although I’m calling this a “task”, it’s really just a page where we’re going to store all the information you need to collect on each client. To do this, click on Add Task. It will add a new element beneath your section header. Name it accordingly so you know it’s a template. After you hit “Enter”, the task will open on the right side of the screen. Enter all the information you want to collect on your clients here. As you can see, I used a system of section headers, descriptions, and checklist placeholders to structure mine. You can set this up however you need to. Just make sure to include all pertinent details and describe them clearly, so there’s no question as to what kind of information should be entered there. Once your template is done, go back to the main Clients project folder. This time, add a new section header for your client list. This will keep your template separated from the live client lists that should be referenced and updated. 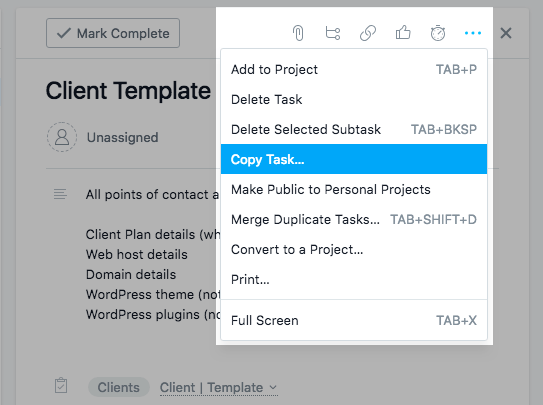 Click on your Client Template “task”. Go to the right side where the template page lives. Select the three dots in the top-right corner of the box. Then, click on Copy Task. This will duplicate your client template folder and place it in the same project folder. Simply give it a name (yours will obviously be named after real clients) and then click on “Create New Task”. You’ll now see your first client show up under the template. To move it out of this section and under your client list, hover over it. See the dots to the left of Client 1? Click on them and drag the item down to your client list section. Repeat this process every time you want to add a new client to your list. Ideally, what a client management system in Asana will do is free you from the burden of tracking down client information in emails, notepads, and a variety of other platforms through which your team communicates. Instead, this centralized and secure system gives you everything you need right away, empowering you to focus on delivering results to clients.